It would be impossible to chat idly with Bruce Bruso about his work for two reasons. First, his company is addressing two of society’s biggest problems, and second, well, let’s just say the specifics of that work aren’t conducive to polite dinner conversation. The latest service offered by Bruso’s Hegins-based CBA Environmental treats the sludge from sewage plants, dries it and repackages it as a clean-burning fuel that can reduce the pollutants created when burning coal. That’s right: clean-burning fuel made from sewage sludge and coal. 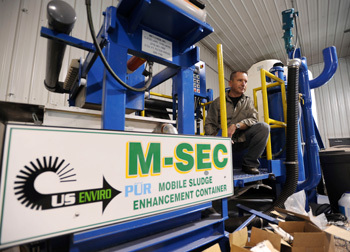 Dubbed a Mobile Sludge Enhancement Container, or M-SEC, the treatment system Bruso began designing and manufacturing in 2004 fits on an average trailer and seems simple enough. There’s a big vat in which the sludge is treated, a press that squeezes the water out of the resulting material and a dryer to reduce the moisture content even further, to about 5 percent. 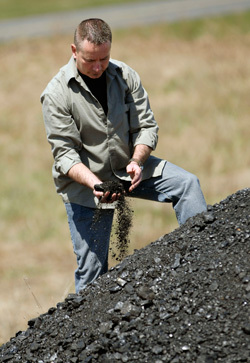 The magic is in the proprietary mixture of chemicals the process uses to neutralize hazardous pollutants in the waste. Bruso says it makes everything completely benign–from pharmaceuticals to heavy metals–by filtering and recirculating the reactants until the liquids and solids are nontoxic. 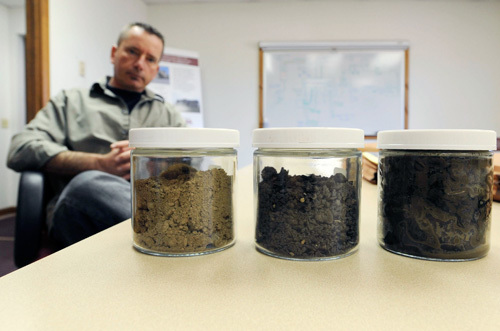 The resulting sludge is then dried to a dirt-like biosolid that Bruso says burns cleanly, produces an exploitable amount of energy and contains a special surprise that energy companies might find attractive. The fumes created from combustion include chemical compounds that “scrub” the emissions of any pollutants, such as sulfur and nitrogen oxides that increase greenhouse gas levels and add to other environmental problems like acid rain. Bruso has also fabricated a machine that “washes” coal of its natural impurities and opens its pore spaces to make it burn more completely and efficiently. He believes the technologies would come in handy for companies such as Allentown-based PPL that rely heavily on burning coal to generate electricity, especially with state and federal governments continuing to push for cleaner fuels and threatening to ratchet down on emissions standards. The washing process can increase coal’s BTU output as much as 75 percent, Bruso says, so much less coal would need to be burned to create the same amount of electricity, which means fewer emissions–including carbon dioxide. That’s why, for all his knowledge and experience, Bruso can’t figure out why he can’t get funding for a full-scale plant. He says he’s talked to politicians and is in talks with two large electricity companies, but no one has produced the $10 million he thinks he’ll need to build a regional hub plant that could treat roughly 40,000 tons of sludge a year. Bruso says the return on investment could be as fast as three-and-a-half years for the treatment facility and less than one year for the $5.5 million it would take to install the coal-washing technology at an average 800-megawatt plant. Each treatment facility would create 15 to 20 jobs, he estimates, and Pennsylvania alone would need 40 to 50 plants to handle all its sludge, which is currently sprayed on fields or incinerated–anything to get rid of it. There’s a “very high interest” among power companies for the fuel, he says, but they need to be sure they can get enough of it before they’ll sign on. That won’t happen until enough sewage-treatment facilities sign up, which won’t happen until Bruso has a plant to treat the sludge, which, in turn, won’t happen until he can secure enough funding either through credit–which is difficult to find in the current recession–or through the government. And that’s what frustrates him. Back in 2004, it was a former state legislator who asked Bruso to figure out what could be done with the sewage sludge that was being dumped on local fields. 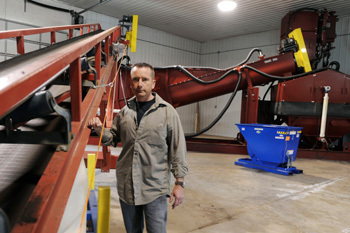 He initially went into the venture expecting to make a safe fertilizer, but the advent of tax credits for alternative fuels pushed him consider the biosolid’s combustion properties. In all, Bruso says he’s sunk perhaps $1.5 million into testing, applications for 14 patents, legal work, fabrication of the small demonstration units and other development needs. Bruso believes he’s shown the worthiness of the process, and yet received little more than assurances from state and federal legislators. So, for now, he continues the soil remediation that’s the cornerstone of CBA’s business while the units sit in the company’s warehouse, waiting for company and governmental representatives, who periodically stop by for a demonstration. Bruso hopes that some of the billions in federal recovery money will trickle his way, but he’s not confident. But Bruso thinks the funding will come when two important problems–where to get the fuel to power our lives and what to do with the waste those lives create–become necessary to solve.